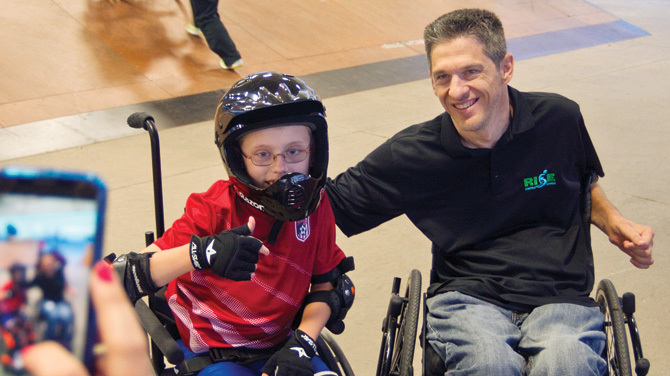 You can see the difference, sometimes in an hour or two, says Chris Goad ’93, executive director of RISE Adaptive Sports. The Irving nonprofit offers physically challenged members the equipment they need to sail, swim, water-ski, kayak, hand-cycle, and wheelchair motocross, as well as play rugby and power soccer. Quadriplegic since damaging his spinal cord at age 17, Goad understands the value of sports for those living with paralysis. At UTA he lettered in wheelchair track, qualified at the national level in table tennis, and played quad rugby. His mentor was the late Jim Hayes, the legendary Movin’ Mavs basketball coach who fought for and won wheelchair accessibility on campus. After being laid off as head of logistics at a Fortune 150 company, Goad began volunteering for RISE. The atmosphere reminded him of the challenge, camaraderie, and exhilaration he’d missed since graduating. After joining the organization in 2012, he has focused on marketing and finding corporate sponsors.